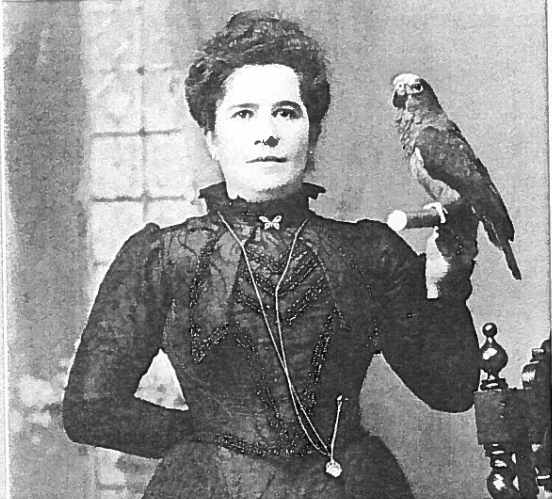 Lillian poses with a parrot in her lush attire for a photographer in her hotel. Taken from Visit’n: Conversations with Vermonters. Vol. 7, Vermont Folklife Center. It is unclear what happened with Shipley – whether they divorced, just broke up, or he died. Lillian ended up settling in Boston where she worked as a prostitute in a brothel called Faneuil Follies. (5) The brothel was one of the most expensive and well regarded in the city, with lushly decorated parlors on the first floor. Her hard determination and head for business led her to manage the brothel in just a few short years. (3) In 1910, Lillian was tipped off by a confidant about an impending raid on her brothel by the authorities. (3) Before she could be arrested, she fled the city to her hometown of East Richford. The building Lillian ‘remodeled’ had three stories and just a stone’s throw from the Canadian Pacific railroad line that stretched from Boston to Montreal. At the front entrance was a “Big, old-fashioned farmhouse kitchen, a great big range, all chrome fronted.”(2) Once you passed the kitchen there was the bar that took up most of the first floor and was on both sides of the border. The second and third floors were reserved for “private entertainment” with girls from Boston and Montreal, the rooms also straddling the border. While the first floor was rough and tumble, the upper floors were described as full of color and decor, giving “an exotic feeling” (7) Officially it was named Queen’s Palace, but it quickly acquired a reputation to be called the “Palace of Sin”. 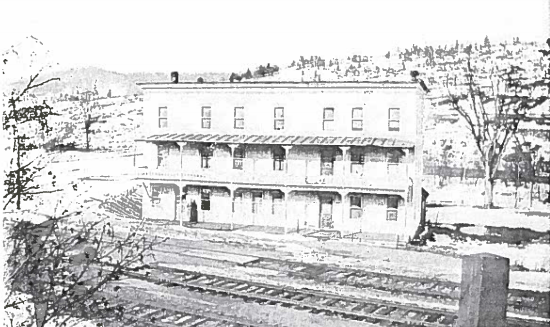 The Palace of Sin adjacent to the Canadian Pacific Railroad Line. Taken from: Visit’n: Conversations with Vermonters. Vol. 7, Vermont Folklife Center. Lillian often showed support for prohibition and the Women’s Christian Temperance Union, which both kept the price for alcohol and her clientele count high. (7) Her patrons didn’t seem to mind; there was always people coming in and out of the Palace’s doors, whether they were locals or tourists. A conductor of the railroad guessed that they stopped at the hotel more than the train station in Richford (8), and Mr. Green’s taxi service parked right at her front door. (2) The hotel was part of the community, a place both men and women went after work to have a good time. But in late spring of 1925, they did. There was a raid on The Palace of Sin from both the US and Canadian sides. In addition to liquor, three ‘couples’ were found upstairs and brought into custody along with Lillian. All were arraigned on June 8th in the Saint Alban’s city court before Judge M.H. Alexander. (1) After almost a decade of operation in plain view of the public, Queen Lil was charged with keeping a disorderly house, meaning the people inside her hotel were considered a public nuisance – a civil crime with only a fine. Although four out of the six people arrested were charged with a statutory offense, one other violating the MANN or white slave traffic act, the Queen paid her $150 fine in the Richford court and walked away to continue her business. (1) Her hotel was highly lucrative, and the fine was nothing in comparison to what she would make in a night. What were the secrets to Queen Lil’s success? What does her story reveal about prohibition– the causes and consequences of the legal effort to prohibit alcohol? What does Queen Lil’s story reveal about Vermonters’ values in the 1920’s? How was the state changing? “Hold Woman For Keeping Disorderly House.” Richford Gazette, 8 June 1925. “William ‘Digger’ Rowley.” Visit’n: Conversations with Vermonters, vol.7. Campbell, Jane. “Lilian Minor Shipley.” Shipley, Lillian – Vermont Historical Society, vermonthistory.org/research/vermont-women-s-history/database/shipley-lillian. Krakowski, Adam. Vermont Prohibition: Teetotalers, Bootleggers & Corruption. Published by American Palate, a Division of The History Press, 2016. Visit’n: Conversations with Vermonters. Vol. 7, Vermont Folklife Center. Wheeler, Scott, and Christopher Bray. Rumrunners & Revenuers: Prohibition in Vermont. New England Press, 2002. “Some Famous Citizens .” Richford Town Profile, Apr. 2007, p. 11. “Earl Cheney.” Visit’n: Conversations with Vermonters, vol. 7. Willis, Al. “PERSIAN PERFORMANCE REQUIRED.” Richford Gazette, 9 Feb. 1927. Diocese of Vermont, Episcopal Church. Journal of the 93rd Annual Convention of the Protestant Episcopal Church in the Diocese of Vermont. Vol. 93-95, Argus and Patriot Book and Job Printing House, 1883. “United States Department of the Interior National Park Service.” National Register of Historic Places Registration Form, 29 Jan. 2001.